This is a camera that is designed in Japan, assembled in Philippines, retailed in USA and shipped to Singapore. Having eyed an DSLR for a while, I had been looking for a low cost and newbie friendly camera. 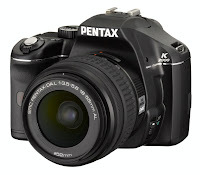 The Pentax K2000/K-m is feature laden and the smallest DSLR that allows backward compatibility to Pentax lenses all the way back to the 1970s. It is also a product that shows globalisation at work. While there are problems getting this product in Singapore because there is a change of the wholesaler here, one can look around the world to get the product you want and often get a good deal. It is also a way to save that bit of money by getting things from where it is cheapest. At the same time, it goes to help the people in retail trade in USA, the people who manufactured it in Philippines, the guys who designed it in USA and the postman who will deliver it in Singapore. My mini stimulus to the global economy. Without this freedom to trade and low barriers to trade, a transaction like this will be too costly to consider. Having said that, I look forward to taking photos with this new camera when it arrives and this blog should have better images after it arrives.